The NHL Trade Deadline is upon us and many players will find themselves with new addresses by 3pm. But which players have done the most relocating in the history of the NHL. Here's a handy guide to 10 all-time journeymen. Sillinger has the largest jersey collection of any former NHLer with an even dozen teams played-for over his 19-year career. Selected 11th overall by the Detroit Red Wings in 1989, Sillinger deserves nothing but kudos for the achievement. He retired after playing 1,049 career NHL games, going the majority of his career without an AHL demotion. The downside to so much travel? : Sillinger has just 43 career post-season games to his credit. In His closet (GP): Detroit Red Wings (129), Anaheim Mighty Ducks (77), Vancouver Canucks (138), Philadelphia Flyers (52), Tampa Bay Lightning (121), Florida Panthers (68), Ottawa Senators (13), Columbus Blue Jackets (155), Phoenix Coyotes (60), St. Louis Blues (64), Nashville Predators (31), New York Islanders (141). Most Notable Move: Traded with Chris Gratton to the Lightning for Daymond Langkow and future “Legion of Doom” winger Mikael Renberg. The most experienced of the four players tied with an even 10 different alumni credits, Schneider was also the most accomplished of the double-digit club. He ranks 22nd all-time in NHL scoring by defencemen (743 points), appeared in two NHL All-Star Games, and won a Stanley Cup in 1993. His career was accented by multi-year stints with the Red Wings and Canadiens but he really racked up miles in his final three seasons, playing with five teams (including a brief return to Montreal) in 2007-08 and 2009-10. In His closet (GP): Montreal Canadiens (383), New York Islanders (78), Toronto Maple Leafs (115), New York Rangers (155), Los Angeles Kings (193), Detroit Red Wings (231), Anaheim Ducks (65), Atlanta Thrashers (44), Vancouver Canucks (17), Phoenix Coyotes (8). Most Notable Move: Part of a six-piece blockbuster between the Leafs and Islanders that returned Wendel Clark to Toronto and gave New York Kenny Jonsson and a first-round draft pick, which the team used to select Roberto Luongo. The Canucks’ 1982 first-rounder takes the CanCon crown on this list for having played on five Canadian NHL franchises among his 10 destinations as an NHLer. Unfortunately for Petit, despite playing over 500 games on Canadian teams, he played just one playoff game in those five stops combined, as a 19-year-old Canucks rookie. Chalk it up to luck or timing, but Petit’s NHL career largely followed the same path: 827 regular season games played, but dressed for just 19 post-season tilts. Petit, however, was a member of the 1997 Eastern Conference Champion Philadelphia Flyers. In His Closet (GP): Vancouver Canucks (226), New York Rangers (133), Quebec Nordiques (82), Toronto Maple Leafs (88), Calgary Flames (134), Los Angeles Kings (49), Tampa Bay Lightning (45), Edmonton Oilers (18), Philadelphia Flyers (20), Phoenix Coyotes (32). Most Notable Move: One of five players Toronto sent to the Calgary Flames in the blockbuster that made Doug Gilmour a Leaf. Daigneault is fondly remembered in both Montreal and Philadelphia, to say nothing of the eight other NHL stops he made over the course of his 16-year career. His first career playoff goal was a doozy, sending the Philadelphia Flyers to a decisive Game 7 against Wayne Gretzky’s Oilers in 1987. Montreal was Daigneault’s longest and most successful NHL stop, though, as the defender won a Stanley Cup (alongside Schneider) in 1993 and stayed with the Habs for parts of seven seasons. He currently serves as an assistant coach with the club. In His closet (GP): Vancouver Canucks (131), Philadelphia Flyers (105), Montreal Canadiens (352), St. Louis Blues (37), Pittsburgh Penguins (66), Mighty Ducks of Anaheim (66), New York Islanders (18), Nashville Predators (35), Phoenix Coyotes (88), Minnesota Wild (1). Most Notable Move: Acquired by Philadelphia in a six-piece deal that sent Rich Sutter to the Canucks. The final member of “Club 10” was a journeyman in the truest sense. He played fewer than 80 games in all but two of his NHL stops and enjoyed his most prominent NHL action between the ages of 31 and 37 when he was finally able to consistently break the 60-game plateau. Most of those minutes came with the expansion Minnesota Wild. Dowd’s NHL career was not without achievement, however. He won a Stanley Cup in 1995 with the New Jersey Devils. In His Closet (GP): New Jersey Devils (121), Vancouver Canucks (38), New York Islanders (3), Calgary Flames (48), Edmonton Oilers (70), Minnesota Wild (283), Montreal Canadiens (14), Chicago Blackhawks (60), Colorado Avalanche (18), Philadelphia Flyers (73). Most Notable Move: Was traded to the Avalanche by the Chicago Blackhawks in 2006 for a fourth-round draft pick. The Avs flipped that pick to the Maple Leafs, who used it to select James Reimer. 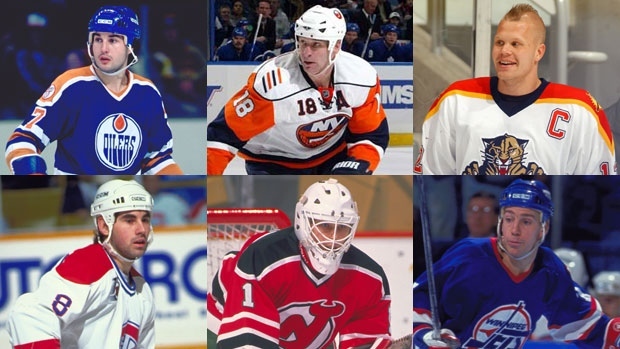 Moving beyond the top five numerically, here are some notable names amongst the contenders for the greatest jersey collection in NHL history. At the time this feature began being assembled, the active leader for number of NHL jerseys worn over a career was Dominic Moore. That was just a month ago. Since then, Finnish veteran Olli Jokinen has pulled level, with a chance to become one of the all-timers. The Feb. 15 deal that sent Jokinen from Nashville to the Toronto Maple Leafs put him on equal terms with Moore, but there’s common belief that the Leafs are simply holding on to the former All-Star until such time as they can flip him to another team looking for veteran presence. Should Jokinen find a new home – and potentially sign with yet another new club as an unrestricted free agent in the off-season – he could be primed to challenge Mike Sillinger for the all-time lead. In His Closet (GP): Los Angeles Kings (74), New York Islanders (82), Florida Panthers (567), Phoenix Coyotes (57), Calgary Flames (236), New York Rangers (26), Winnipeg Jets (127), Nashville Predators (48), Toronto Maple Leafs (6). Most Notable Move: Dealt by the New York Islanders alongside Roberto Luongo in one of the most lopsided trades in NHL history, netting the Isles Mark Parrish and Oleg Kvasha. Ed. note: The Leafs dealt Jokinen to the St. Louis Blues before the 2015 NHL trade deadline. Welcome to Club 10, Olli! It’s easy to lose track of Coffey’s career after his years with the Oilers dynasty and Mario Lemieux’s Penguins. Some will remember his reunion with Gretzky in L.A. or his point-per-game years with Steve Yzerman’s Red Wings, or maybe even his stops in Philly or Hartford. But those who remember him with the Chicago Blackhawks, Carolina Hurricanes or Boston Bruins just earned themselves a pat on the back. Still, the Hall-of-Famer remained productive to the very end, posting 40 points in 69 games as a 38-year-old Hurricane in 1999-2000. We're counting Coffey as a nine-team man, since his stops in Hartford and Carolina were separate trips. He did not make the move with the franchise. In His Closet (GP): Edmonton Oilers (532), Pittsburgh Penguins (331), Los Angeles Kings (60), Detroit Red Wings (231), Hartford Whalers (20), Philadelphia Flyers (94), Chicago Blackhawks (10), Carolina Hurricanes (113), Boston Bruins (18). Most Notable Move(s): Two, really. Coffey orchestrated his exit from the Oilers for a package of four players highlighted by Craig Simpson. He was also dealt by the Red Wings along with Keith Primeau to Hartford in the trade that brought Brendan Shanahan to Detroit. Burke book-ended his first NHL stop with Olympic appearances for Canada, a feat that was rare in the late 1980s before NHLers routinely went to the Games. Once he settled back into the League following silver at the 1992 Albertville Olympics, he established his reputation as a reliable keeper that could withstand a lot of rubber. A three-time All-Star who played for eight franchises in nine seasons, Burke faced more career shots than all but six goaltenders in the history of the League, but he also wore more jerseys than any netminder in NHL history. In His Closet (GP): New Jersey Devils (162), Hartford Whalers (256), Carolina Hurricanes (25), Vancouver Canucks (16), Philadelphia Flyers (26), Florida Panthers (66), Phoenix Coyotes (211), Tampa Bay Lightning (35), Los Angeles Kings (23). Most Notable Move: Traded to Vancouver in 1998 by the Carolina Hurricanes for long-time franchise keeper Kirk McLean. Before Sillinger came along, Ashton held the distinction as the most traded player in NHL history. There are two amazing stats in there to consider. First of all – unlike Sillinger – Ashton never moved through free agency, so every time he uprooted, it was via trade. The second is that his rights were traded twice on the same day in 1981. Factoring out a change of address when the Colorado Rockies moved to New Jersey to become the Devils, Ashton played for eight NHL franchises. Yet he was traded nine times. He also had his career cut short by a knee injury at 32 years-old. So, who knows how many more stops he would have made? In His Closet (GP): Vancouver Canucks (124), Colorado Rockies (80), New Jersey Devils (76), Minnesota North Stars (97), Quebec Nordiques (172), Detroit Red Wings (108), Winnipeg Jets (222), Boston Bruins (87), Calgary Flames (32). Most Notable Move: Ashton was dealt to the Jets by the Red Wings straight-up for Paul MacLean, who finished the team’s third all-time leading scorer. Carl Voss had a pretty full resume in the NHL, including a Calder Trophy and a Stanley Cup. He also had an impressive collection of jerseys. Playing on eight different teams may not seem all that impressive, but there are two huge factors to consider. First, he played for eight teams over the course of an eight-year career. Second, his eight year career spanned 1926-27 to 1937-38 when the league topped out at 10 teams. In His Closet (GP): Toronto St. Pats/Maple Leafs (14), New York Rangers (10), Detroit Red Wings (46), Ottawa Senators (40), St. Louis Eagles (48), New York Americans (46), Montreal Maroons (24), Chicago Blackhawks (33). Fun Facts from the Fascinating Life of Carl Voss: Voss later became the NHL’s Referee-in-Chief and was inducted into the Hockey Hall of Fame as a builder. He was the inaugural winner of the Calder Memorial Trophy. He scored the Stanley Cup-winning goal for the Chicago Blackhawks in 1938. He also won the Grey Cup in 1924 with Queen’s University. May played 393 career NHL games and the majority of them - 345 to be precise - were as a member of the Washington Capitals. While in D.C. the winger proved a reliable, nearly-everyday player and an absolute penalty-minute machine. In 1989-90 alone he racked up 339 minutes in the box, a mark that still ranks among the top 50 single-season totals in NHL history. But May's claim to fame goes beyond his aptitude for getting whistled. He happens to be the most-traded player in the history of the NHL's Deadline Day. Though he only played for five NHL teams he was part of four separate Deadline Day deals, placing him one ahead of three-timers Dan McGillis, Steve Konroyd and Hall-of-Famer Mike Gartner. In His Closet (GP): Washington Capitals (345), Boston Bruins (3), Edmonton Oilers (3), Dallas Stars (35), Calgary Flames (7). Most Notable Move: Dealt from would-be Stanley Cup runners-up Boston Bruins to would-be Stanley Cup Champion Edmonton Oilers at the 1988 trade deadline in exchange for winger Moe Lemay. He did not see any playoff ice-time as a member of the Oilers.